These are truly amazing! 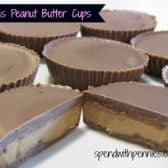 I made these Copycat Reese’s Peanut Butter Cups as a gift for my husband.. but of course I had to test one out. Ok, two.. I tested two. And then he gave me one… to share. And then I stole one… but there were still lots left for him! 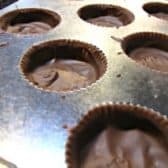 Melt chocolate at 50% power in the microwave stirring every 30 seconds. The chocolate does not have to be completely melted, as it sits little pieces will melt in. Be extra careful not to overheat the chocolate or it will seize. 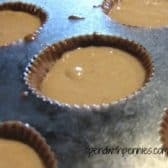 Place about a teaspoon of chocolate in each well or muffin cup and with the back of a spoon, "pull" the chocolate up the sides ensuring the bottom and sides are completely covered. Microwave about 90 seconds to soften the mixture and allow it to be poured. 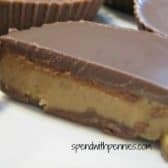 Place 1 tablespoon of the peanut butter mixture into the wells and gently tap or shake to smooth it.